You are learning to learn. You are learning to receive Knowledge. You are learning to value Knowledge. 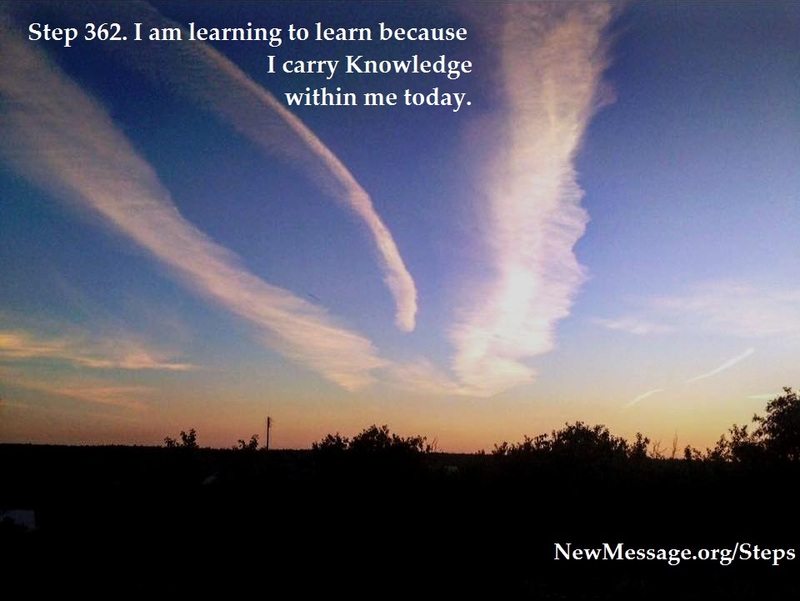 You are learning to carry Knowledge. You are learning to express Knowledge. You are learning to cultivate all of your mental and physical faculties that are essential for this overall preparation. You are a consummate student. Therefore, be totally engaged with your studenthood today, which will free you from false assumptions and from placing impossible burdens upon yourself. That which is given in truth you will naturally be able to do, for you are naturally created to do this. Your physical and mental vehicles, those things that are tied to this world, will naturally be engaged in your true fulfillment. Learn to learn. Learning to learn means that you are learning to participate. It means you are both following and leading all at once. You follow your Teachers and their program for development, and you lead your mental and physical vehicles. In this way, leading and following become all the same, as giving and receiving are all the same. Thus it is that those who receive will give and those who follow will lead. Thus it is that those who give will need to continue to receive and those who lead will need to continue to follow. Here the duality of such things disappears. Their uniformity and their complementary natures are recognized because this is simple, because it is apparent and because it is true. Remember this idea upon the hour and use your two practice periods to engage yourself with Knowledge in stillness and simplicity. Allow these final practice periods in this program to have great depth. Give yourself to them as completely as you can, for in doing so you will increase your capacity for Knowledge and your experience of Knowledge. As your capacity and experience of Knowledge grow, your desire for Knowledge will grow as well, for Knowledge is your true desire. Practice 362: Two 30-minute practice periods. Hourly practice. June 18, 2014 Round One: It is all so very subtle, this carrying, expressing and being a vehicle for Knowledge. I am not sure I’ve got it, but I am open to learning, I am learning to learn. My compass is how I feel inside about a decision. If I do not rush or jump to conclusions, but live with an idea for a while, I am better able to hear Knowledge, or what I believe to be Knowledge at least. When things are right, they all fall together, things fall naturally into place, and there is no resistance. 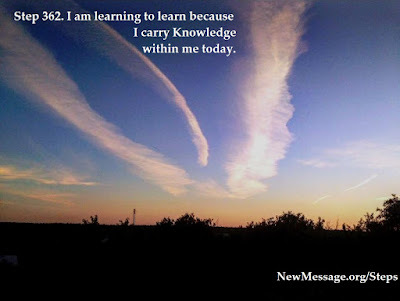 I still do not really know what it means to carry Knowledge, or what my relationship with God is like. I am holding onto this. Knowledge is indeed my true desire. August 10, 2014 Round Two: I have to admit that I have not been giving dedicated time to my Steps practice the past few days. I feel that Knowledge occupies a firm and steady place within me, I am ever cognizant of it, and I do not need to set aside special times to connect with it. I appreciate the deep meditation practices and they refresh and revitalize me, but I have not had the luxury of engaging in them the past few days. I am trying to get back into my work mode, but am often distracted. I need to let myself “be” with my work and ignore Sasha. Plus Greg came back again yesterday on the train and then the bus. He got here in a record 4 ½ hours! This is a reminder that I need to give myself more completely to my practices, despite the distractions. I have a true desire to increase my capacity for Knowledge and my experience of Knowledge. I wish this capacity and experience to be a natural part of living, for this to be integrated into my daily routine. I feel that this is happening.